The Enormous Crocodile is more of a chapter book than a picture book in length and format, but be warned, it's not actually divided into chapters! So a "just one chapter" promise can get quite long :) Basbusa loved this one, and we've read it cover-to-cover four or five times. I adored Roald Dahl's books when I was little, but I had forgotten that although the plots are easy enough for a little child to understand, the language isn't. Plus, some of the topics that are fun-scary for an older kid would be much-too-real-scary for Basbusa! 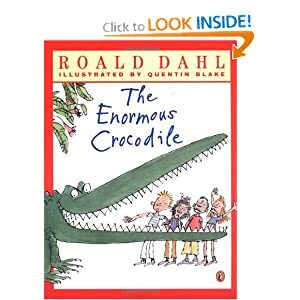 But I think The Enormous Crocodile is a great introduction to Dahl for little kids. 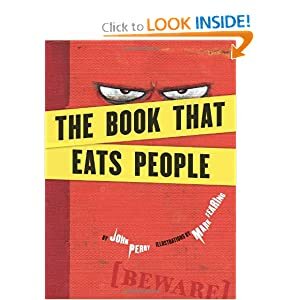 It's about a very big, very mean crocodile with "secret plans and clever tricks" to catch six delicious, juicy little children for his lunch. That might not sound like appropriate content for a three-year-old, but actually the characters are so clearly caricatures that it's funny rather than scary - even Basbusa knows that he's not really going to gollop anyone up at one gulp. There's also quite a bit of name-calling, which I usually avoid; but since the Enormous Crocodile really is planning to eat up yummy little children, I didn't mind reading aloud, "Oh, you horrid greedy grumptious brute!" 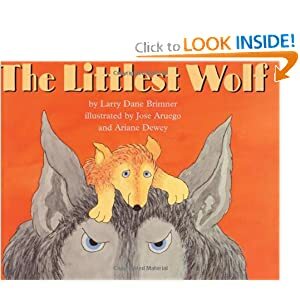 I chose The Littlest Wolf because the author, Larry Brimmer, had written some Easy Readers we enjoyed. An unusual way to arrive at a good picture book, I know, but I'm glad we found this one. It's the story of a little wolf, the youngest of his siblings, who is feeling discouraged because he can't roll, run or pounce as well as they can. His father comforts him, and he ends up cheerful again. It's not much of a plot in terms of excitement, but the little wolf's emotions are very true to life, and his father's reassurances soothe him without minimizing his feelings. "'It is true that Ana runs like the wind, and you run like a soft breeze,' he said. 'That is just as it should be. ... Running like the wind comes later.'" Basbusa seems to really like that message - I've heard her use it herself once or twice when there's something she can't do. Two other things I liked about this story is that it's the Daddy doing the comforting rather than the Mama, which makes a nice change, and that the author uses very pretty language. "It was a perfect summer morning. Big Gray was watching his pups frolic in a poppy-dappled meadow. But not all of them frolicked. 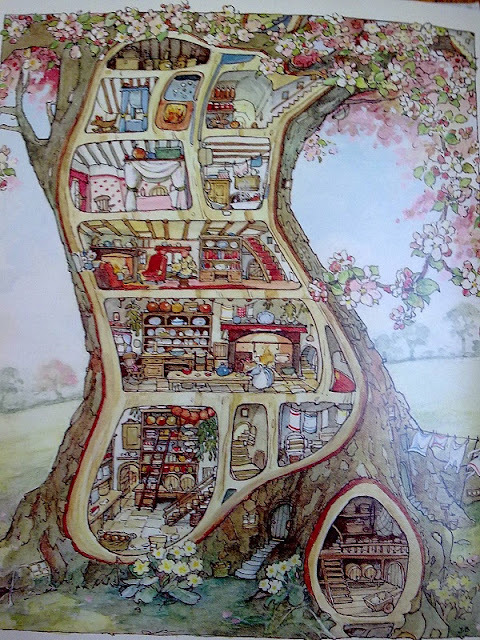 One pup, the littlest, peeked out at the others from behind the trunk of a great, gnarled oak." I was a bit disappointed in the illustrations, though - I thought they didn't live up to the pretty descriptions. 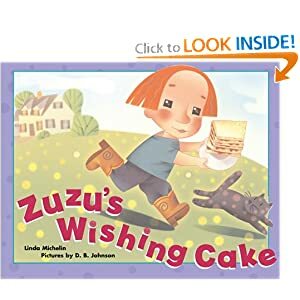 Zuzu's Wishing Cake is the story of a little girl who wants to make friends with the little boy who has just moved in next door. In the end she does, and they end up sitting happily side by side and sharing the wishing cake. 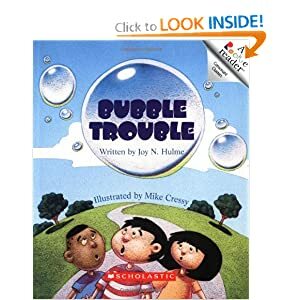 What makes this book unusually appealing is the very sweet young-child logic that Zuzu uses in trying to get to know him. He's not coming out to play? Hmm. Maybe he can't see what a nice day it is! He must need a telescope. Well, that's no problem; she can make him one! Which she cheerfully does, having unrolled all the paper towels to get at the cardboard tube. Basbusa is still very interested in the nuances of the making-friends process, so the plot was a hit with her, and she also liked that Zuzu narrates her thoughts to the reader with speech bubbles. I liked Zuzu's self-confidence, and how she makes things, paints things, cuts things and glues things just as a routine part of her play, rather than as specially-designed "craft project." I also liked that Zuzu, as shown on the cover here, is not particularly "cute," as illustrated preschoolers go. You don't often see children in books who just look like average kids. And finally, like last week, I wanted to mention another set of Early Readers that we have enjoyed. The Rookie Readers series seems to come in three levels (A, B and C), and so far Basbusa has enjoyed almost all of them. I don't present them as part of a "reading lesson" or anything like that - I just leave them in a pile with all her other books, and she chooses whatever catches her interest. She has always loved books that are little, though, regardless of the content - her favorite book at moment is a pocket dictionary - so these do at least have that much going for them, right off the bat :) The Level B books (such as Bubble Trouble, shown at right, which is her favorite to date) are just perfect for her reading level. She can read these without any assistance, and although the story-lines are necessarily somewhat curtailed by the limited vocabulary, the excitement of independence more than makes up for it! And even in my own opinion, the plots in the Rookie Reader books are ok. Not amazing, but by the standards of Early Readers, not bad. Pretty good, even. Other books she keeps returning to from this series are All Wrapped Up, Carousel Ride, Lightning Liz, Quite Enough Hot Dogs, and Sara Joins the Circus. Basbusa did like this book, but her interest-level corresponded more to the plot rather than to the illustrations.The story-line in Spring Story tells of the surprise birthday picnic that the other mice organize for little Wilfred, and it's a sweet and pleasant tale, although it wouldn't have been particularly memorable on its own. We tried the sequel, Summer Story, but the plot focused on the wedding plans and eventual wedding day of two of the mice, and Basbusa couldn't really relate. 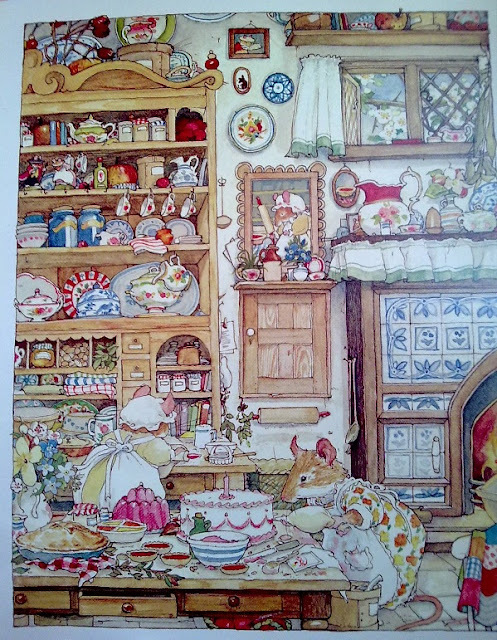 Equally breathtaking illustrations, though. 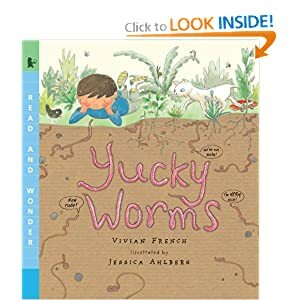 Another long-ish blog-silence, for the same reason as before - Basbusa is so enthusiastic about chapter books these days that we're not reading anywhere near as many picture books, so our book-per-day count has gone down considerably. Although I'm glad she's excited, of course, I can't help feeling that it's a bit soon to be leaving the picture-book universe. She's only three and a half! To me it feels like watching a toddler wearing shoes with heels - ok, I can see she's delighted to be so fancy, but surely she can't play properly in them...? I guess it depends what she's playing, though... And in any case, it's probably only a phase, and not something I need worry about unless she's still ignoring picture books a few months from now. 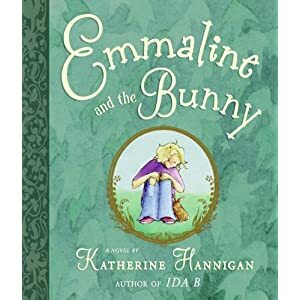 So, here are our favorite chapter-book read-alouds from the past two weeks. 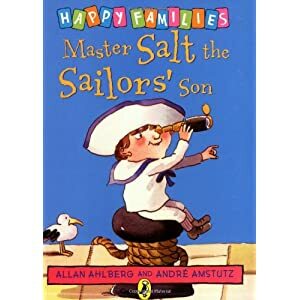 We read another five or six which I'm not mentioning, either because they were clearly above Basbusa's comprehension level (not that she was willing to stop reading them), or because I found myself skipping or editing frequently to tone down mean-child behavior in the stories. 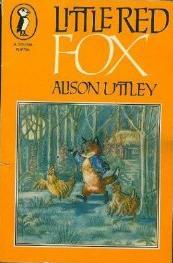 Basbusa was also crazy about The Little Red Fox by Allison Uttley. 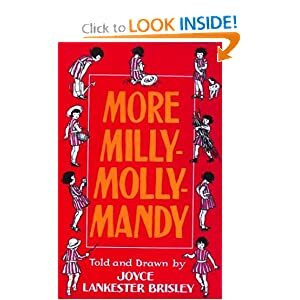 She actually read this one, unbeknownst to me, with Grandma, because I had found it in a box of my own childhood books, pre-read it, and found it too boring to want to sit through again. But Basbusa sat through the whole thing in two sittings with Grandma, absolutely enthralled, and has been mentioning the characters in her pretend-play ever since. It's about an orphan fox who is adopted by a family of badgers, and occasionally pursued by an evil and sneaky old uncle. 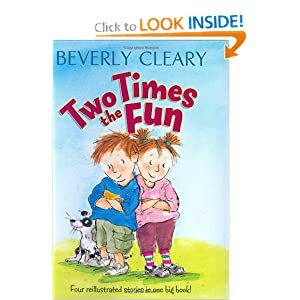 Two Times the Fun has four short stories about the everyday adventures of four-year-old twins called Jimmie and Janet. Basbusa could completely identify with their excitements and disappointments, savoring Jimmie's tremendous satisfaction in having dug a big, real hole in the backyard with a big, real shovel, and fully understanding his dismay when he woke up from his nap to find Janet curled up inside his hole, pretending it was a nest. It didn't take us long to finish the whole book and leave me searching - yet again! 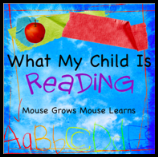 - for more age-appropriate chapter books, but that's my only criticism!